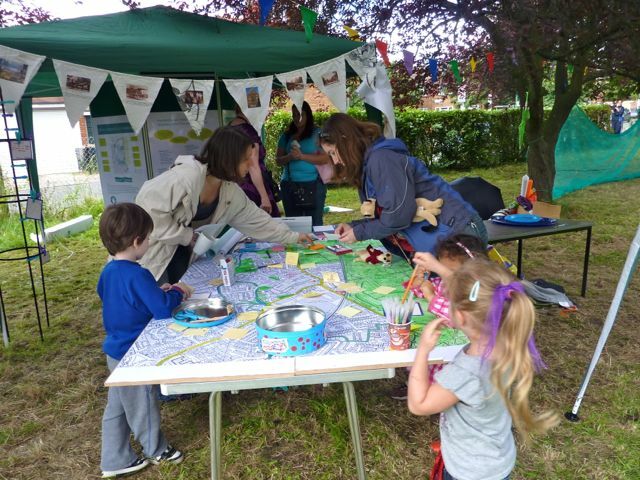 On 7 July 2012, the Hackbridge Carnival started at Hackbridge Primary School with a parade around local streets, arriving at All Saints Church to an array of festivities. The NDG thought this was an ideal opportunity to speak to residents to consult and get their views about Hackbridge. A selection of notice boards were prepared to gather vital information and a huge map of the area was used for children to mark all types of things like places of interest, areas needing improvement or where they lived. In the hope of glorious sunshine, we enticed people to our stand with free watermelon chunks which went down very well!